I was twenty-six years old. I drove my car out to the barn to see my horse. As I drove the drive I knew in my sleep, the drive I had done thousands of times and would do many more, I spoke with my Godmother on the phone. We chatted and I slowed around the curves, accelerated coming out of the bends, and squinted into the western sky at sundown. Kathy was the kind of phone call you didn’t want to miss and that you hated to say goodbye to. Her chuckle and wry whit shared as much joy in the delivery as what she actually was saying. This talk was no different. I had just shared a particular annoyance about my new-to-me-through-marriage family, and she listened and um hummed through the whole thing. When I paused for a breath before launching back in, she stopped me. I pulled over to the shoulder alongside the barn’s driveway entrance and turned off the car, flicking on my hazards. That hot embarrassment feeling slid up my neck and reddened my face. I mumbled that I hadn’t prayed for them or about it but felt very righteous in my annoyance. My embarrassment gave way to laughter. Yes, I liked their pies. Okay, then. Small steps toward being able to pray for them. My Godmother has been dead for five and a half years but when someone annoys me, when someone persecutes me, either perceived or intentional, I remember that dusty side of the road in rural Minnesota, and her chuckle about desserts. My relationships are as imperfect as I am, but finding a common place to start loving someone and then being able to pray for them has helped me weather eight years of marriage. 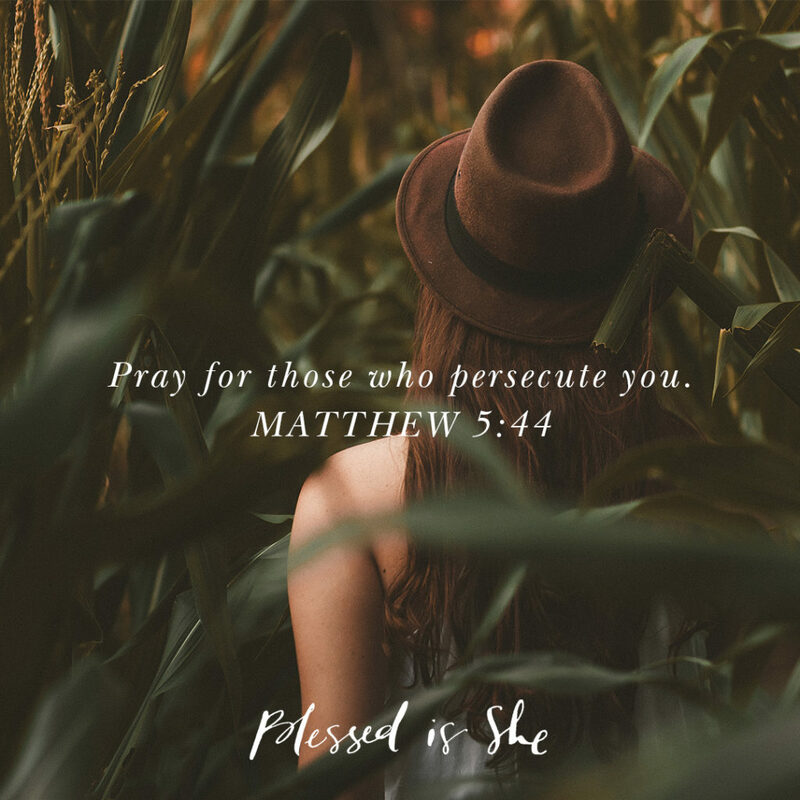 Can you pray for those who are your enemies? Can you find one thing that makes them lovable? Maybe that’s your start. Nell O’Leary is a recovering lawyer who blogs and sews while tending to her husband and four kiddos in the great city of Saint Paul, Minnesota. She serves as Managing Editor for Blessed is She, blog, sews, and can down a iced chai tea latte in no time flat. Find out more about her here. I love this. Thank you. And it helps me to think about my own God Children. Am I feeding them with the kind of love and wisdom your God Mother did? Thanks again. Thanks needed to hear that. My co-worker is cagey, evasive, meddling and controlling. I’ve caught her in lies more than once. She’s tried to throw me under the bus more than once; I don’t trust her as far as I can throw her. I just want her to go away. Can I find one thing that makes her lovable? Umm… she has nice, shiny hair. Does that count? How about her ability to put on a fake, sickly-sweet smile? Nell, you have such a gift with story telling and words. I am always amazed after I read one of your reflections, but this one in particular hits home. Thank you!